Editor's note: Story compiled with Ramon Taylor in Jacumba, CA, Aru Pande in York, PA, Aline Barros in Lumberton, NC, Kane Farabaugh in Ottawa, IL, Mohamed Olad Hassan in Minneapolis, MN. On a rocky hill outside Jacumba, California — almost within earshot of the U.S.-Mexico border — two rival gas stations duel beneath a towering American flag. It is a quintessential American scene: Locals and out-of-towners fill up with gas and drive into the open desert. But this waypoint is in the shadow of the border wall, both the part that is built and the part that isn't. "People come from Mexico and take jobs that people here in the U.S. could be doing," argued Patrick, a supporter of President-elect Donald Trump and second-time Republican voter from El Centro, a nearby border town. Jairo Carcamo, an independent who referred to former presidential candidate Hillary Clinton as a "sellout" and Trump "a racist," is willing to give the 45th president a chance to deliver on his do-good promises for the economy, but doubts the border wall is part of the answer. "If [Trump] wants to secure the border to keep the drug dealers out, to keep bad people out, good. But let in the good people," he said. "We need hardworking people, we need immigrants, because an American isn't going to go to the field and pick up apples for $4 a basket." Patti Myers Wiseman, a lifelong Democrat, thinks there's no point in giving Trump a chance. Trump's failure to release his tax returns and his lack of political experience are enough to deter her from considering her president "qualified." "He hasn't paid taxes in however many years because of loopholes," Wiseman said. "He is already trying to say that within the next few months or 120 days, he'll repeal Obamacare and this and the other, and I think he's going to wind up getting himself impeached." As Wiseman takes one last drag of a cigarette, she reveals her greatest fear involves not the economy, nor the tax returns, but the prospect of a sudden war. "That red button," she said. "That guy [Trump], he knows a lot of tricks. He is smart, he is a businessman. And if you want to do something great for this country, he will do it," said Greek-American Yani Pripas, who came to the U.S. in 1975. Owner of Greek Super Foods at the York Central Market, he voted for President Barack Obama twice, but this year he went for Trump. What he wants is for Trump to make life in America like it was in the 1970s. "People, they used to be happy. They had money. It was not as many strangers in this country," he said. 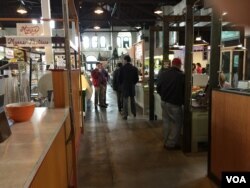 On the day before the inauguration, a daily lunch group convened at the market in downtown York. The group was a mixture of Republicans and Democrats and included attorneys, a sheriff and business owners. They meet and talk about their lives, their community — and today, for VOA, their politics. "I still can't wrap my head around this election. I am going to the inauguration tomorrow and I am excited for it. It's my first one," said Louis Rivera, who moved to York a year ago with his husband. Rivera has voted straight Democratic since 2008. But he is less excited by the prospect of the next four years. "I am expecting the worst right now because of what [Trump] has said, but we are giving him the opportunity to change what he has said, and reach out to everyone," Rivera said. Jenna Geesey sees the Trump administration as a way out of a stalemate. "I hope he keeps good on the promises of building up our national security and reforming our health care system," Geesey said. "For far too long, there has just been a stalemate of inactivity and no real legislation that has been helping the middle class." "In order to make me feel better about him as a leader, [Trump] would have to become a more thoughtful speaker and more of a diplomat," said staunch Democrat and attorney Audrey Woloshin. She said she was "diametrically opposed" to the philosophical and ideological positions of Trump and his Cabinet selections, "so I am fearful, fearful." 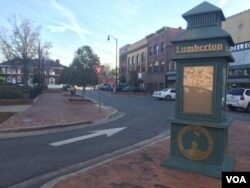 Lumberton has an unemployment rate about 2.5 percent higher than the national average. "Between 1996 until 2001, we lost close to about 8,000 jobs," said Gregory Cummings, director of the North Carolina Industrial Development Commission. "We were losing metalworking. We were losing textile markets. … We were primarily made up of textile operations. … We got hit very hard." The year 1996 was about two years after the enactment of NAFTA, the North American Free Trade Agreement. "When Trump says NAFTA was not true free trade, when it is only free trade one way — that got people's attention here," said Phillip Stephens, chairman of the Robeson County Republican Party. Small-business owner Tanner Smith has been a Democrat all his life. But this fall, he voted Republican. What does he want from Trump? "Keep his promises and take action before he takes office with some of these jobs," Smith said. India Lowry, a Democrat, who did not vote for Trump, moonlights in a deli to supplement her job with the county. "When we get the majority of our goods from China, it's very concerning," she conceded. Business owner Alton Locklear, a Trump voter, said he thanked God that the new president would be taking the country in a new direction. "I've spoken to several people in my community about adding on workers, because they're excited," he said. Lumberton is real Bible belt, he said — churches on every corner. "Quite honestly, Trump just said all the things we've all been thinking all this time about what we should do about Islamic extremism, immigration, the taxes we're paying," Locklear said. The corn will not be planted in the flatlands of Illinois until April, so there is a lot of time now to think and talk about the change in administrations. Farmer Monty Whipple tills fields that were once worked by his father and uncle about 12 miles (19 kilometers) from Ottawa. But the game has changed in recent years and depends more on trade. So while Whipple voted for Trump, he did so as a last resort: "We export a lot of our produce, whether it's grain or even the meats, and [the] livestock industry relies a lot on exports. He's come down heavily against some of our trade agreements that we've put together in the past — NAFTA and so on." Farm insurance agent Robert Hasty described himself as more Republican than Democrat but could not bring himself to vote for Trump. Hasty said he was politically conservative but found himself becoming more socially liberal. "I'm concerned about ... the moral fabric ... the things that he's said and done. I have two little daughters, and the things that he's said when he's up on the podium I find unsettling." Somalis started coming to Minneapolis in the 1980s. By 2013, the community had grown to 25,000 people, owning hundreds of businesses. Somalis skew Democratic but are active in both parties and, as VOA's Somali service learned, they are comfortable switching parties. Faduma Yusuf is a proud Republican who ran for the Minneapolis City Council in 2013. But she voted for Obama in 2008, then Mitt Romney in 2012. This year, she did not vote. "Once I saw Trump actually insulting my own Somali community, the immigrant community, and he labeled the people who came here to survive and have a better life for themselves and for their kids as terrorists," Yusuf said. "I decided not to vote for him." FILE - Female members of Minnesota's Somali community. Social activist Faisal Derie voted for Obama twice, but this year, he went for Trump. "I believe he would be one of the best presidents of the United States history, if not the best. I am expecting him to really do well as a president and get along with the world and the Democratic leaders," Derie said, adding, "Since he is [a] businessman and not from [a] political background ... I think he would feel the pain of the poor people." Samsam Aden, a Somali-American student who came to Minneapolis four years ago as a refugee, voted for Clinton because she said her future under the Trump administration seemed uncertain. "I and my three siblings had a dream to pursue education and determine what we can be in our new home country, but now, as a man threatening my community is leading the nation, we are uncertain what the future might hold for us," Aden said, adding, "In general, I am not optimistic about the future of Muslims in the U.S."
Abdi Mahamud Mascade contributed to this report from Minneapolis.